The preparations of expedition started 6-7 months ago with Daniele, it was decided that logistics and base camp will be shared. Tomek also became part of team in September to share permit and logistics. I had time constraints, i had only 15 year end leaves, but my employer did me a favor and offered 15 more days, which means i have one month. It was decided that, there will be meeting in Chilas on December 20. But what sounded as bad news to me: Daniele announced just a week before December 20 that we should wait 10 more days and held meeting on December 30. If i had waited ten more days, i would have left only with 20 days. I simply could not wait, i was there to climb a mountain which was all over my dreams since last few weeks. Since we had permits in our, Ali decided to take me to base camp. We started trek and and acclimatized swiftly. Daniele further delayed expedition by taking part in making videos and other projects, because he had commitments with sponsors. I was there to open route to summit of Nanga Parbat in winters, i was not there for making any videos. We had limited time and we had to make quick decisions. I had already experienced Mummery rib in 2013, we could only open the route half way. This years conditions we more dry, and all other routes on Nanga Parbat Diamir side were too dry. We decided to go for Messner 2000 route, Opinion was shared by Tomek. Now coming to the question of taking radio with us, a lot of stories were build based on nothing. We did not took radio with us, because it was of no use, since Ganalo shoulder is blocking signals from Messner 200 route to Diamir base camp. We informed Daniele of our decision to attempt Messner 2000 route on Lunch Jan 08. We left on Jan 9 without presence of Daniele since he was left for camp 1. We moved to Kinshofer footstep, then left towards foot of Messner route beside Ganalo. We had to establish many Bivouacs along the way. We decided to move slow once we reached 6000 meters, we were not acclimatized enough, so we kept out vertical meter ascend to 500m from there on. We established deposit at 7200 meters, It was too cold and we could hardly feel our bodies. We made an ascent of 300 vertical meters to reach 7500 m next day and descended back to tent at 7200 meters. It was when we started preparations for summit push, and next day we were to start summit bid. It was when we received message from Daniele that, we will not receive any relief from here on. We were disappointed, because instead of being admired, we were getting this kind of messages. We keep our loved ones posted about our progress. We choose not to reply Daniele because we had only one bar of battery left in satellite phone. Nexy days on Jan 17, we started summit push and reached 7800m when the winds strengthened and clouds started gathering. It was such a hard decisions to make, i felt summit in hands as it was only 300 vertical meters away. We started descend from 7800 m. On the descend a snow bridge broke and Tomek fell into a crevasse at around 6500m and i helped him come out, and tomek made all the descend with hurt leg and i really admired him for that. I am thankful to Pakistanis, they helped Tomek with injuries. I requested Ali to change my flight date from Jan 18 to Jan 23. I rested couple of days in base camps, and before leaving i told Daniele about my plans. It was the morning i woke up everyone was sleeping and i had to leave. I am in contact with Tomek and he keep me posted about his health. Q. Do you have plans to come back to mountain next year? For now is to late, but I’m thinking about coming back again to this mountain to complete the story. Q. what are your plans in future? my job, some holiday with my husband and some trip in Alps for future. Dec 24 reached base camp and spent two nights there. Dec 26 camp 1 at 5100 meter. Dec 27 went a little higher and came down to base camp. Dec 28 started again from base camp, night at camp 1. Dec 29 started from camp 1, reached 5400 meter, could not find a way on glacier to reach the foot of Messner 2000 route, and spent night at 5400m. Dec 30 came down to base camp with all the gear and decided to go for original Messner route, which lies on right of Mummery rib. Spend one night at base camp. Jan 01-Jan 03 spent three days on the original Messner route, Climbed little higher than 5300m and decided to go back to Messner 2000 route, there was incalculable risk on original Messner route due to seracs. Jan 09 Left base camp and spent night in camp 1. Jan 10 spent night in camp 2 under Ganalo peak, found a way to connect with the way that leads to the foot of Messner 2000 route. 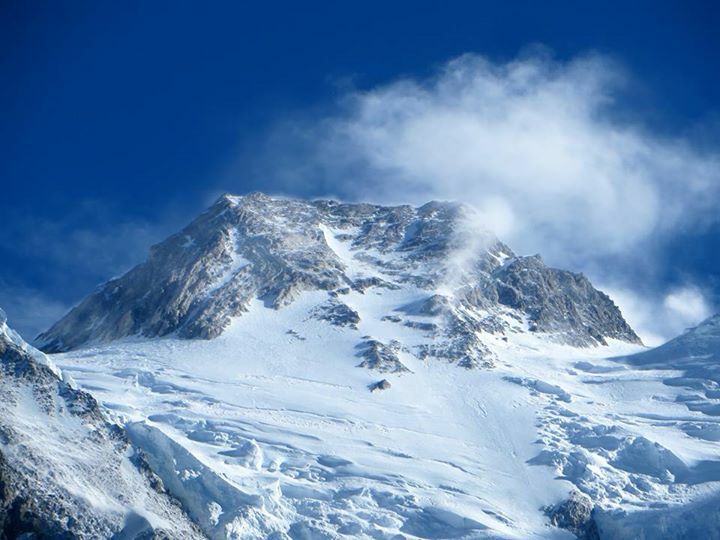 Jan 11-12 ascend to camp 3 at 6200 meter, at the foot of Messner 2000 route. Jan 11 was also spent here due to fast wind. Jan 13 started further ascend and established bivouac at 6500 meter. They had to ascend slowly due to acclimatization factor, and they were carrying supplies for 10 day. Jan 14 continued ascend and set another bivouac at 7000 meter. Jan 15-17 continued ascend and set another bivouac at 7200 meter. The next day, they went up to 7500 and came down to camp at 7200 meter. Jan 17 was the day when they launched final assault on summit from 7200 meter, they reached 7800 meter when wind strengthened, weather turned back and they had to retreat to 7200. Jan 18 Descend to base camp, unfortunate accident took place, when a ice bridge broke and Tomek Fell into crevasse, and Elisabeth rescue him, and they both descended to base camp. Seems not really true what she writes. Daniele clearly offered help in the case of emergency to her in his text message to Camp 4 – his message was published word by word on various sources before. Not sure why she would lie on this issue – but it makes you wonder about the rest. Nevertheless, excellent effort! I wish you all the best. Different people will come up with different stories. Reality is what you know alone. Mountain climbing is a unique sport. No matter how many team members you have, you’re always alone because it is You against the Mountain. Good luck and I hope you make the summit someday soon Insha’Allah.